Steven Mallory stands with his family. 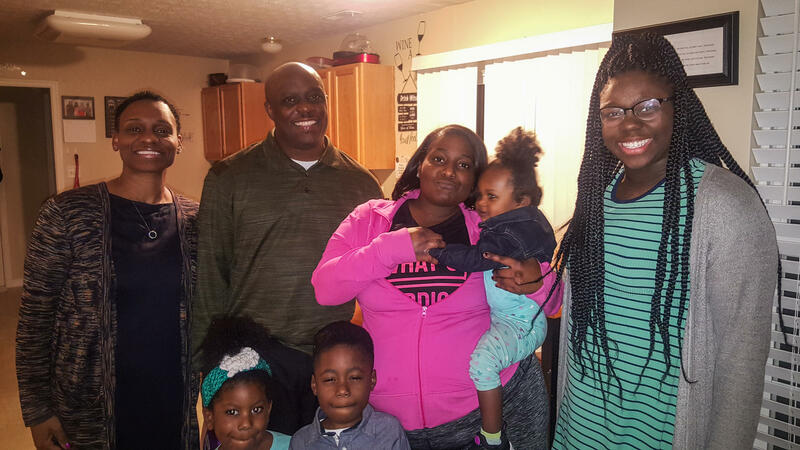 From left: Tracey Mallory, Steven Mallory, Tina Groves, Zharia Mallory, along with his grandchildren. Steven Mallory stands outside his massage clinic. But on Dec. 18, 1992, his friend Antoine Gibson died, and he decided enough was enough. "I went to his funeral and the guy that was sitting in front of me — my friend Darnell Cochran — said, 'I can't picture myself being in a box,' " Mallory said back in 1994. "But later on that night, he got killed, and I just said, I just can't live it no more. I have too much to live for." So he quit the drug scene, but when the money stopped coming in, he had no money to support his three children with his ex-girlfriend Afrika Groves. Groves turned to welfare, and the government went looking for Mallory for failing to make child support payments. Mallory ended up in a counselling project, which was part of a national program called Parents' Fair Share. In these interviews with NPR from 1994 and 1995, Mallory had just turned his life around and detailed his struggle and perseverance in doing so. Over 20 years later, Mallory, 44, now lives in the Northridge Estates subdivision just north of the Dayton city line. Here, there are single homes with garages and neatly mowed lawns. It's the very vision of a middle-class suburb. He is Dad to three grown children from his days with Groves and one teenage daughter with Tracey, his wife of 18 years. Tracey is an elementary school principal. Their teenage daughter, Zharia, will be making college visits this summer. He's also a grandfather of four, with a fifth one on the way. Mallory still works with Montgomery County, but after a couple of promotions, he's now a scale operator. "Then, I was out in the trash," he says. "Now, I'm at the beginning of the trash; I don't even smell it no more." He's also running his own businesses: a lawn care service and a massage clinic. 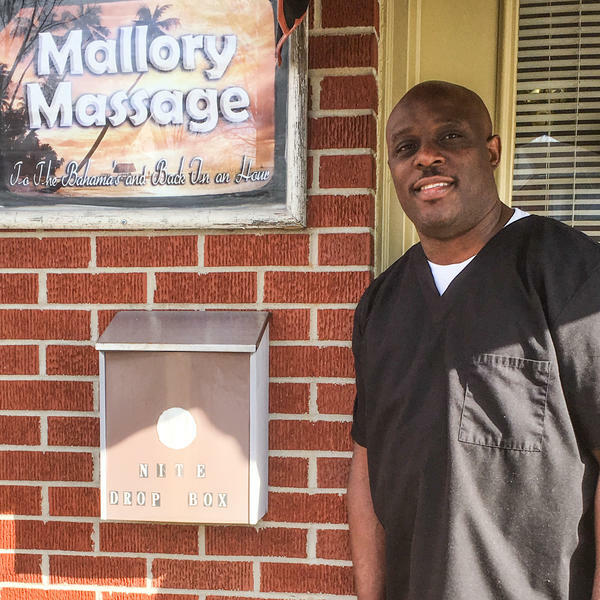 He took an 18-month course and became a state-licensed masseur. But the clinic is very much a part-time venture. Mallory says it pays the rent, but not a lot more. He has another passion; he has made four rap videos on YouTube. One video, in which three friends sitting in a car suddenly disappear with an edit, is a reference to his own adolescence. In a four-year span, he says, he went to 17 funerals. And a lot of his friends went to jail. Although he now has a steady income and lives in a nice house, the payoff isn't just material. "People treat Mr. Mallory way better than they treat Steven," he says. He says when he goes to the doctor now and hands over his insurance card, people help him. "I remember going to the doctor when I didn't have any insurance, and they called me Steven, and they would say, 'Well Steven, I can't — this is the best I can do,' or 'I can't do nothing for you.' "
Back then, Mallory imagined a life unlike anything he had ever experienced. Since his interview back in 1994 and 1995, one question has remained: Is Mallory OK? As it turns out, he's much better than that. Over the past 30 years of doing this job, I've often wondered whatever happened to some of the people I met and interviewed, especially people who were at some precarious turning point in their lives and who spoke candidly with me about their hopes for the future. How did the future turn out? How did it turn out for Steven Mallory, who was 22 years old when I last saw him in 1995? Mallory is from Dayton, Ohio. And when I met him, he had just turned his life around. He had a job literally doing Dayton's dirty work, cleaning up after the garbage trucks dump their load at the county incinerator. He had been a fast-living teenage drug dealer given to fancy cars and expensive suits and known on the streets of West Dayton as Monte Carlos. He told me about his past life when we met 23 years ago. STEVEN MALLORY: When I started back about '90, I never really counted it up, but I was making at least five to $600 a day. SIEGEL: Mallory told me that one day he decided enough was enough. MALLORY: Yeah it was December the 18th in '92 when my friend Antoine Gibson died. I went to his funeral. The guy that was sitting in front of me - my friend Darnell Cochran - said, I can't picture myself being in a box. But later on that night, he got killed. And I just said I just can't live it no more. I have too much to live for. SIEGEL: So he quit the drug scene. There was a catch. Mallory had three children who lived with his girlfriend Afrika Groves. When the wads of cash stopped coming in, he had no money to support the kids. Afrika turned to welfare, and the welfare department looked for their father. Steven Mallory ended up in a counseling project that steered him toward a job. It was part of a national program called Parents' Fair Share. When I met him, he had gotten a GED and started working. He told me he was determined to be present in his children's lives not like his own absentee father. He said the only good memory he had of him was one day when he was about six. MALLORY: He took me and my two sisters by this other woman fishing. I still remember like it was yesterday. We went to the river, and I don't really know nothing about the man. I wore a suit fishing, you know, with some dress shoes on. You know, he let me take my shoes off and run around in the water with my two sisters and throw rocks in it. Other than that, if he would've never did spent that, I'd probably wouldn't even talk to him today. I can't call him father or a dad. And I'm like, what's up, man? SIEGEL: This was something that young Steven Mallory had talked about at the counseling program. He wanted his kids to be able to call him dad. Mallory struck me as a young man with imagination - a quality I didn't see in the other men I met in the program back in 1995. He could imagine a life completely unlike his own - no gangs and drugs, no welfare dependency, a solid family, savings. MALLORY: A lot people (unintelligible), you know, go out around the clubs around here. I say when I go out, I want to go to the Bahamas, you know? I'm the type of person that pays now and going to party later. SIEGEL: Steven Mallory age 22. I wondered if the 44-year-old Steven Mallory bore any resemblance to the person he had hoped and planned to become, so I went back to Dayton. UNIDENTIFIED WOMAN: There he is. MALLORY: A long time no see. SIEGEL: ...Since I saw you. MALLORY: Still working with the Montgomery County. I got a couple of promotions. I'm a scale operator now. Then I was out in the trash. Now I'm at the beginning of the trash. I don't even smell it no more (laughter). SIEGEL: He's also running his own businesses - a lawn care service and a massage clinic, which he speaks of as his shop. He took an 18-month course and became a state-licensed masseur. So how close to the Bahamas have you gotten in this time? MALLORY: We went to the Bahamas - let's see, one of the pictures - no, that's Vegas. We went for our birthdays. It was 16 years ago. Matter of fact, my mission statement at my shop is to the Bahamas and back in an hour. MALLORY: Yeah, so still true to the dream. I stay true to the dream. SIEGEL: I visited Mallory's massage clinic. It's a space designed to be relaxing. It's candlelit. He pointed out the earth tone color scheme to me. He said he chose it to look not too feminine, not too masculine. Joani Thomas is a regular client. MALLORY: Have any aches or pains since we've seen you last? THOMAS: Yeah, in my shoulder. SIEGEL: The massage clinic is very much a part-time venture. Steven Mallory told me it pays the rent but not a lot more. Mallory has another passion. He has made four rap videos that are on YouTube. My character is somewhat schizophrenic, but he's not schizophrenic. He's just telling his story from different stages of his life. MALLORY: (Rapping) I'm in a jungle fighting for my life. And if I want to see tomorrow, I got to fight through the night. SIEGEL: If I want to see tomorrow, I have to fight through the night. This video is called "Ha Ha." Mallory plays the streetwise drug dealer he used to be. It's very professionally produced. In one scene, three friends are sitting in the car and then with an edit, they all suddenly disappear. It's a reference to his own adolescence. MALLORY: In a four-year span, I went to, think, 17 funerals. MALLORY: Yes. A lot of our friends, you know, went to jail, what we considered Buck Rogers time. And when you watch a television show, and it's like 2036 is when their out date is. I couldn't do it. I couldn't do it. SIEGEL: Seeing Steven Mallory today as an enterprising middle-class suburbanite reminded me of the capacity for imagination that I had seen in him back in the 1990s. He imagined a life unlike anything he had ever experienced, and he made it happen. MALLORY: We're in a nice house. Back then a person told me that everybody has roaches, you know, I would have believed you. But now I see that, you know, everybody doesn't. Everybody grew up and survived off welfare. That's the main means of support, and it's really not. I received a pay check every payday from that point on. SIEGEL: And the payoff isn't just material. MALLORY: People treat Mr. Mallory way better than they treat Steven (laughter). You know, I go to the doctor, and they're like, can I see your insurance card? And I give my insurance card. They be like, oh, how may I help you, Mr. Mallory? What would you like to see done? I remember going to the doctor, and I didn't have any insurance. And they called me Steven. They said, well, Steven, you know I can't (laughter) this is the best I can do, you know, or I can't do nothing for you. SIEGEL: Mr. Steven Mallory of Dayton, Ohio, whom I interviewed back in 1994 and 1995. I wondered ever since whether he's OK. Turns out, he's better than OK.
(SOUNDBITE OF THE LUMINEER'S "PATIENCE") Transcript provided by NPR, Copyright NPR.